"A wonderful meat loaf that is fairly easy to make. Pairs well with a variety of side dishes. This can be a meal in itself or can be served with mashed potatoes and biscuits. Surprisingly good cold!" Mix tomato sauce, tomato paste, ketchup, sugar, onion powder, garlic powder, 1 teaspoon oregano, 1 teaspoon black pepper, and 1 teaspoon Worcestershire sauce in a bowl. Place stewed tomatoes in a large bowl; crush tomatoes using a fork. Add turkey, crushed crackers, onion, green bell pepper, eggs, 1 tablespoon oregano, thyme, 2 tablespoons Worcestershire sauce, garlic, and 2 teaspoons black pepper; mix until evenly combined. Spoon meatloaf mixture into the prepared baking dish. Form into a loaf, leaving about 1/2 inch between loaf and sides of dish. Spoon half the tomato topping over the loaf. Bake in the preheated oven for 45 minutes. Spoon the remaining tomato topping over loaf and top with mozzarella cheese. Bake until no longer pink in the center, 15 to 20 more minutes. An instant-read thermometer inserted into the center should read at least 160 degrees F (70 degrees C). If you use ground beef instead of turkey, use extra lean (93/7) because it tends to get really greasy if you use beef with a higher fat content. It is also good to add a can of carrots or corn to make it a little heartier. This can also be baked in 2 loaf pans. Bake loaves for 30 minutes before adding remaining tomato topping and cheese; bake additional 10 to 15 minutes. This was different but very good. Makes enough to feed a houseful. Excellent for people who don't eat red meat, plus lower calories. Absolutely recommend it. 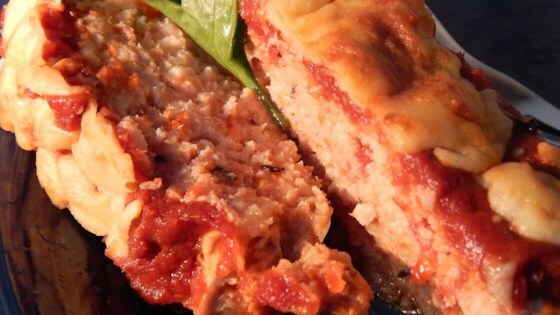 Turkey meatloaf needs a lot of flavor and this has it!